Drop Card Marketing | Order Drop Cards, Sizzle Cards, and Dollar Bill Business Cards » Hello world! DropCard – Drop card marketing tool to promote your business. Business cards that look like money. 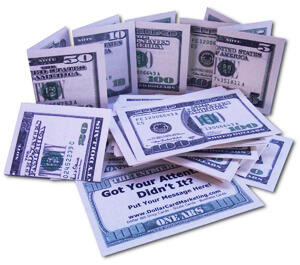 Drop Card Marketing, a Effective Guerilla Marketing Tool to Promote Your Business! 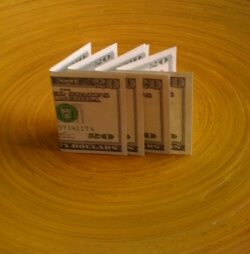 Drop cards look like real money! 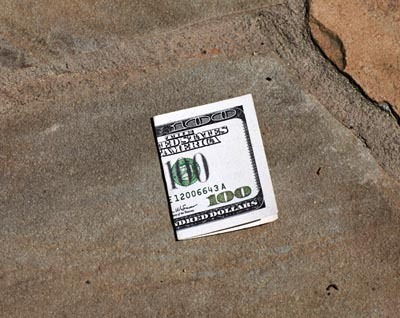 People will pick up your drop card thinking they found cash. Curious, they will find your message promoting your business. Drop cards are the most effective way to promote your business or event offline. It is a great tool for marketing, lead generation, and increased sales for your business. It’s guaranteed to get attention and peak curiosity. They are also known as sizzle cards, money cards, or dollar bill business cards. Drop cards are the size of business cards and look and feel like real money. They are the same height and thickness as a real dollar bill and approximately 3.6 inches in width. You can choose from $5, $10, $20, and $100 dollar bills. You can completely customize the color, layout, and even add images or your business logo to your dropcard. We offer the best price on the internet for drop cards and a higher quality drop card.